Unable to receive email [[imap.gmail.com] But a am receiving email. Which email app are you using -- the stock Samsung email app? If you have a strong preference for getting your Gmail through the stock email app (rather than using the Gmail app itself), then try removing you Gmail account from the stock email app, and then add it back again. It's also possible you have your account set up in more than one email client, and incorrectly in one of them. 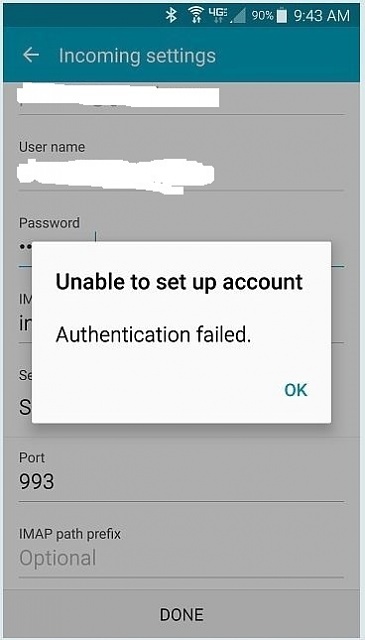 That would explain why you are getting messages (in the client that is set up properly) but getting the error (from the one that is set up incorrectly). Can you tap on the error notification and go to the client that is generating it? I am using My Mail. Where do blocked messages go? My spy app det metro zte phone is making hidden calls and im getting duplicate in triplicate messag. Do you have problems getting keyboard to work near left edge also? Which new upcoming phone to get for longevity? Why I get pink and green lines when I play videos on Instagram Stories?